Join us for SKSP 2011! In 2010 Gamers all over Scotland undertook a 24-hour gaming marathon and raised over £7,000 for the Sick Kids Friends Foundation, who help the patients and their families at the Sick Kids Hospital, Edinburgh. They were supported by Edinburgh’s own Rockstar North, the creators of Grand Theft Auto. 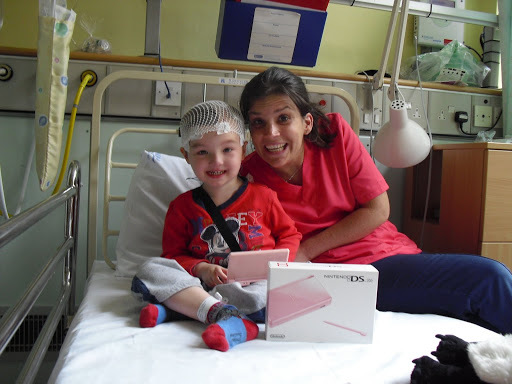 Codemasters UK also donated Nintendo DS lites for the brave children in the wards of the Sick Kids Hospital. Our top player was Freakyzoid, who raised a staggering £778.05 including gift aid. As they attempted to play games for 24 hours they kept in contact through facebook and twitter, and a strong gaming community emerged. Now is your chance to join that community, because this year we plan to do it all again, only this time bigger and better! In various 24 hour slots between 12.00am Friday 7th October and 11.59pm Sunday 9th October gamers will be undertaking a marathon on thier sofa. They will be collecting sponsorship through Just Giving to help an important local charity. If you want to be part of it, join us on facebook and twitter, and watch this space for further details…. As the dust settles on our mammoth gaming undertaking, work at the Sick Kids goes on. A lovely little boy called Aiden – a patient cared for in ward 7 – was thrilled to be the first to try out the DS and Bella Sara game donated as part of Sick Kids Save Point by the guys at Codemasters. Pink is actually Aiden’s favourite colour and he was more than happy to pose with Play Specialist Lorraine for a few photos. Hopefully Sick Kids Save Point can continue to raise some much needed smiles in the future. We’re thrilled to announce that, in support of Sick Kids Save Point, games giant codemasters have donated 2 brand new DS Lites with Bella Sara games to the Royal Hospital for Sick Children. Hopefully these will be enjoyed by patients for a long time. Thanks Codemasters!